I just had a message with this title. I don’t know the details, the only things that comes to my mind is “When you can defeat your opponent, make him your ally ” lol lol ! Catherine Hicks (Janet Pearson) as the step mother tying up with her step daughter. I can’t forget the “Rolling On the Floor Laughing” (ROFL – wink to Kya Rafun) moments with my family while watching this movie. And the “nemesis becoming friend”, it was about Katie’s first boyfriend Joey, a rocker teen, not into parents at all. Dr Fishbinder advice Doug to make Joey his bestfriend … And so he did, he showed him his album collection, told him about rock shows at that time and even, let him race with his car … which ended crashed by a train! Matthew Perry (Chandler from “Friends“) debuted in this movie as the bad boyfriend! Doug Simpson: Now, what have we learned today? Katie Simpson: [sighing thankfully] I learned to never, never ask my dad a question he doesn’t have the guts to answer. Katie Simpson: Dad, when I broke a date with Joey he thought I was dating another guy, he followed me here. Men are so insecure! Another big figure of the comedy just past away. 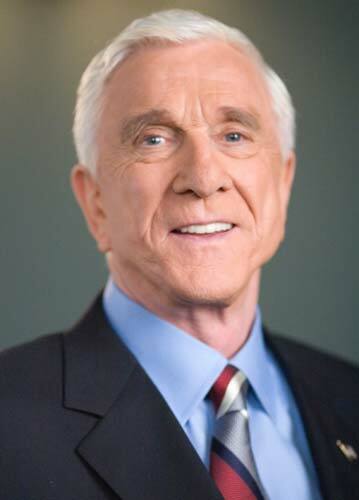 Little Thoughs for Leslie William Nielsen 1926 – 2010 (“The Naked Gun Series“). May you rest in peace … and don’t make them laugh too much in paradise!